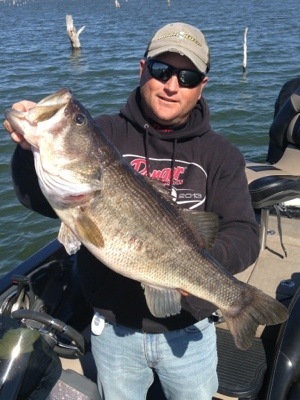 The fishing here on Lake Fork was very good last week as we had three consecutive days with a bass over 9 pounds (9-08 Wednesday, 9-05 Thursday, 9-00 Friday) in my boat. 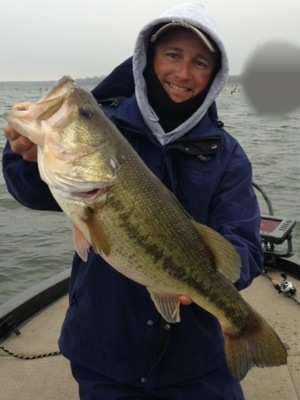 We also caught multiple fish over 7 pounds, and lost a giant bass that we saw that was easily in the 11-12 pound range. I also had the opportunity to guide on a smaller public lake on Tuesday, and my client caught an 11.00 pounder with me that day. What a week! I took the weekend off to watch my daughter play in a softball tournament, and I’m glad I did. The wind and the weather were horrible this weekend!! The water temps early in the week were in the low 60s in the afternoons, but with the cooler temps later in the week, the water temps stayed in the 57-58 degree range all day. Water temps today are 52-54 degrees. The water level as of this writing is 398.61 or 4.39 ft below normal pool. Water is very stained in the upper ends, and gets a little clearer as you move south. There were quite a few fish on beds in the upper ends, and stills tons of staging fish both north and south. It looks like our spawn will be a little more spread out this year (as is normal), compared with last year when it seemed like the majority of the fish spawned close to the same time. Up north, my best baits have been a white chatterbait with LFT Live Magic Shad as a trailer, a Texas rig, and a drop shot. I’m pretty much concentrating my efforts in 1-4 feet of water. Fish the soft plastics slowly and very tight to the timber for best results. 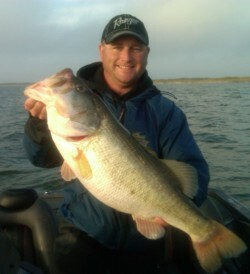 You can catch fish on the chatterbait on wind blown banks and points. Just put the trolling motor down, and cover water. 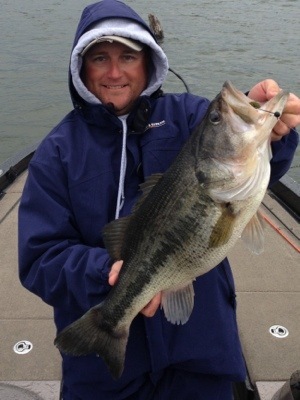 The LFT Live Magic Shad is important to achieving maximum success when fishing a chatterbait. I’ve tried just about every trailer known to man, it there is nothing that comes close to producing both the quality and quantity of bites that the Live Magic Shad produces. I typically start with the 4.5″ version this time of year, but some days, they seem to bite the 3.5″ version better. 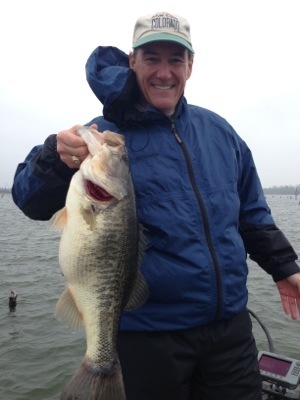 In the fall, I throw the 3.5″ in Live Magic Shad almost exclusively. 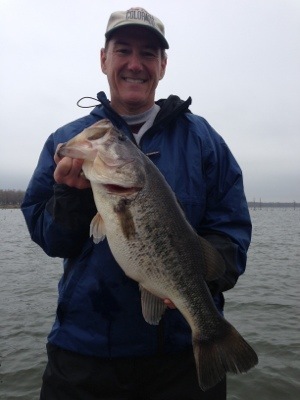 Down south, I am fishing a little deeper, and concentrating my efforts on main lake and secondary points. 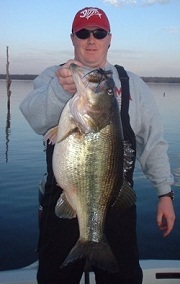 Right now, it’s tough to beat a Piglet Shaky head by Santone Lures. 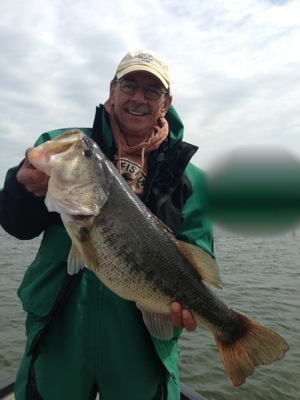 A good bait to screw onto the jig head is a LFT 10″ Lake Fork Worm with the tail torn off. Good colors are Watermelon, Watermelon Red, Watermelon Gold, Watermelon Blue, and Green Pumpkin. A small soft plastic crawfish will also produce bites when attached to the Piglet. I’m also pitching stumps with a drop shot. This is a super effective technique when the fish are finicky and holding very tight to cover. The bite will probably be a little slower the next couple of days after this cold front passes, but by the end of the week, I look for things to pick back up where they left off. I know I can’t wait to get back out there tomorrow.